Manny Pacquiao weighs in at 144.6 lbs. The man is a politician, a world champion boxer, a singer and possibly most important to his fans, a Filipino. One of the biggest stars in the world was in the Bay Area Wednesday and for Manny Pacquiao fans it doesn't matter what hat he was wearing. 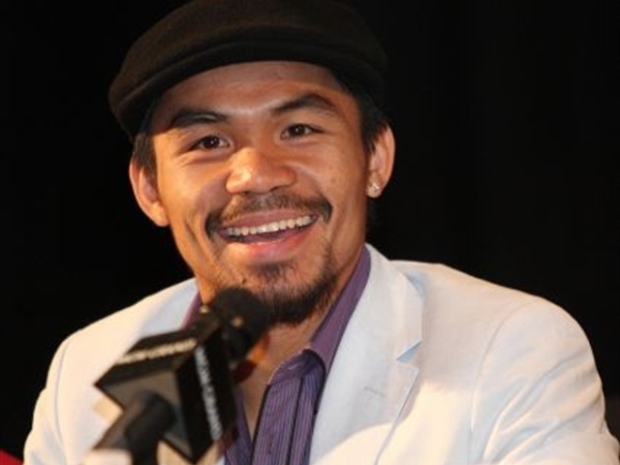 Pacman, as he is known, visited Vallejo not to show off his killer jabs or even talk politics about his native Philippines but instead the prize fighter was in town to sing to his adoring fans. About 250 fans paid $150 to hear their hero sing at the Hiddenbrooke Golf Club fresh off his WBC super welterweight championship fight. Boxing champion Manny Pacquiao delivers a knockout performance. The superstar not only delighted his fans but he also paid homage to the small town's mayor and councilmembers on stage. "It says a lot about him that he'd take the time to stop in Vallejo," Vallejo Mayor Osby Davistold the Vallejo Times-Herald. "It's impressive that's able to take his talents as a boxer, congressman and entertainer and use them well." For Pacquiao fans, it didn't matter where the star was in the Bay Area. They would have shown up. Just ask the San Francisco Giants.